Messages from the Past: Carrier Pigeons at the Schuyler House? In addition to developments in science, technology, industry, and transportation, we must add improved methods of communication to the list of humankind’s accomplishments over the past couple of centuries. Between email, text messages, Facebook, and the good old fashioned telephone (not to mention the mailbox), we now have multiple ways of getting in touch with someone, some of them almost instantaneous. 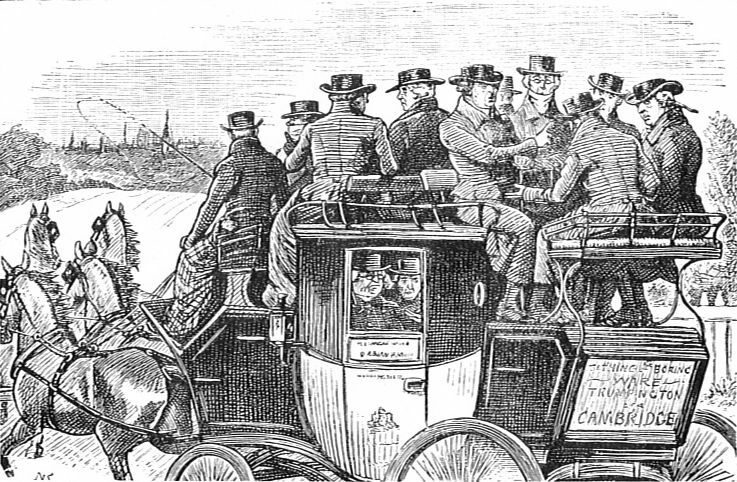 In 17th- and 18th-century America, letters were typically sent by stagecoach, a horse-drawn coach that stopped at an inn at each stage of a journey. Mail was collected at the inns, and could be sent overseas on merchant ships for a fee. In 1789 Congress created the United States Postal Service as part of the federal government. By the end of the 18th century, America had 400 post offices and 12,000 miles of postal routes (Gan: 11). Despite this growth, sending mail via the postal service was expensive, and not a viable option for many Americans living outside of the established routes. Before the development of the railroads, It could take weeks for a mailed letter to reach its recipient. By the 1830s, trains carried mail, and could deliver a letter from coast to coast in about seven days (Gan: 14). The 1840s saw the invention of the telegraph, which sent encoded messages along a system of wires. Not long after, machines were developed that could turn telegraph codes into printed letters. These letters were printed on tape, adhered to paper, and delivered as telegrams. Despite the speed and relative convenience of the telegram, they were expensive, and lacked privacy, as one had to rely on an operator to print and deliver one’s message (Mountfield: 32, Jarnow: 11-12). The invention of the telephone in 1876 revolutionized the world of interpersonal communication. To this day we rely on our phones to quickly pass along our news, whether it is good or bad, important or trivial. So what did Americans do before the telephone, or telegram? Although we of the 21st century have surely become accustomed to a very different idea of urgency when it comes to communication, there must have been pressing news bulletins and crucial personal messages in the 18th century. In those critical times, how did people get in touch with one another? These artifacts, excavated from the grounds of the Schuyler House (part of Saratoga National Historical Park) suggest one possible option. These artifacts consist of thin sheets of rolled vellum, about 2 ½ inches wide. One is secured with a thin bone ring. After some brainstorming here in the lab, we arrived at the idea that these vellum sheets may be messages once transported by carrier pigeons. 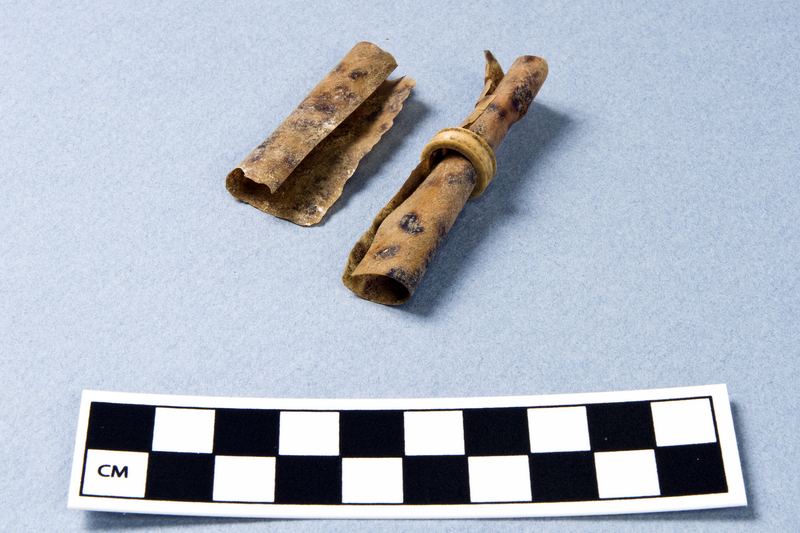 Rolled vellum strips from Schuyler House excavation, Saratoga National Historical Park. Photo by Norm Eggert for NMSC. You may be aware that carrier pigeons were used as message carriers during both World Wars. Perhaps you have heard the story of the World War I pigeon hero Cher Ami, who saved the U.S. 77th Division when they were trapped behind enemy lines in the Argonne Forest. Carrier pigeon Cher Ami was dispatched to other American troops who were unknowingly firing upon their trapped comrades. Despite being wounded by German fire, Cher Ami successfully delivered his message and saved the American troops. During World War II, “G.I. 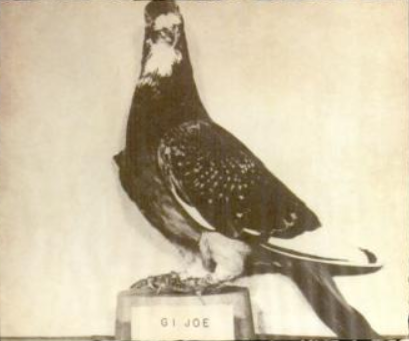 Joe” (another carrier pigeon) saved the lives of over 1000 British soldiers. The British attacked and won back the Italian city of Colvi Vecchia from the Germans, but were unable to call off the planned American air raid by radio. G.I. Joe successfully delivered the message to call off the raid (Blechman: 32-35). Although well known for their 20th-century war heroics, carrier pigeons have been used to relay information since at least the time of the ancient Egyptians, who spread the word of new pharaohs and flood waters via pigeon. By the 8th century B.C., pigeons were used regularly by the Greeks to carry messages. Caesar dispatched carrier pigeons during the siege of Rome, and in 1815, news of Napoleon’s defeat at Waterloo spread via carrier pigeon. Why the pigeon? As explained by author Andrew Blechman in his enjoyable book, Pigeons, carrier pigeons, also called homing pigeons, routinely travel over five hundred miles per day at speeds over 60 mph, and are capable of flying for several hours at speeds as high as 110 mph (Blechman: 4-5, 8). Blechman goes on to write that “with hollow bones containing reservoirs of oxygen, a tapered fuselage, giant breast muscles that account for one-third of its body mass, and an ability to function indefinitely without sleep, the rock dove is a feathered rocket built for speed and endurance…the rock dove can reach peak velocity in seconds and maintain it for hours on end” (Blechman: 8). In addition to their speed and endurance, pigeons are docile, easy to handle, and always return to the place where they were raised. Carrier Pigeons at the Schuyler House? The rolled sheets of vellum that we encountered in the boxes of Schuyler House artifacts were not attached to bird bones. So, what led us to the possible carrier pigeon interpretation? Initially, it was a hunch. The little rolled scrolls just looked like the right size. Based on the above history, it would not be surprising to learn that people in Saratoga, New York were using carrier pigeons in the 18th and 19th centuries. The size may be appropriate, and the history may support this theory, but that is not enough for even a tentative id. The question remains: do the elements of these mystery artifacts from Saratoga parallel the materials commonly used in messaging by pigeon? As we researched carrier pigeons and the messages they transported, an idea that had seemed far-fetched at first began to look more and more plausible. By the time of the Second World War, carrier pigeons were transporting their messages inside of small capsules with screw-on caps that were attached to the birds’ legs. In the latter part of the 19th century, people used quills or metal canisters to protect their messages during flight. Earlier methods involved simply rolling the message, securing it to the pigeon, and sending it on its way (see microscopy website reference at end of article). But securing it how? The 1849 story The Carrier Pigeon tells the tale of a loyal pigeon that saved its original owners from being murdered by a band of thieves. In this story, a young girl named Emma takes in a dove (pigeon) as a pet and later gives the bird as a gift to her neighbor. When the neighbor discovers that a group of criminals intend to murder her friend’s family, she and her mother send a note of warning with the pigeon. A passage in the story explains exactly how this was done: “’Let us fasten a note on the dove’s neck, and it will soon be in Falkenberg’…Emma ran and brought down the dove, while her mother was writing the note. 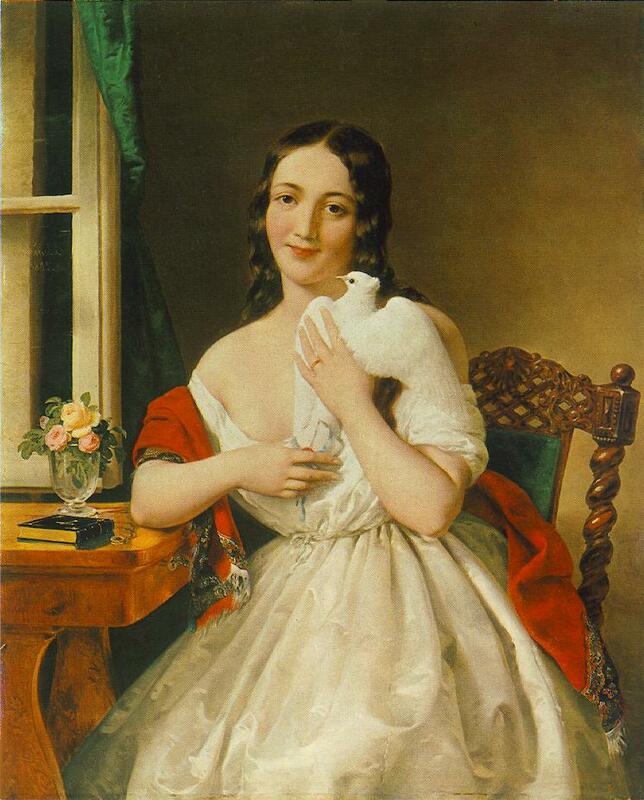 They tied it firmly to the red collar that Emma had placed on the dove’s neck” (Schmid: 47). The Carrier Pigeon is a charming 19th-century moral tale with a pervasive theme of goodness, innocence, and purity triumphing over evil. (For those of you waiting in suspense, the pigeon successfully delivers the message, and the family is saved!) Particularly interesting to us in this story were the logistical details regarding the message. As this story attests, at least in the 19th century, a message might be tied to a collar around the pigeon’s neck. It could also be tied to the pigeon’s foot, as suggested by this 1873 engraving. How exactly would the bone ring from Saratoga have been used to attach a message to a pigeon? It didn’t seem feasible that such a tiny – and inflexible – ring could slip over the pigeon’s foot. If we could determine the use of the bone ring as a carrier accessory, our theory would make more sense. In 1866, the Reverend Charles Bullock wrote about carrier pigeons in Our Own Fireside. According to this book, “the old plan was ‘to write either words or cipher, or some very abbreviated form of communication, on a strip of the thinnest vellum, or other material, and then to wind it firmly but neatly round the scaled part of the pigeon’s leg, fastening it with fine sewing silk.’” Bullock also notes that in addition to the leg, a message could be “fastened to the center feather of a pigeon’s tail, which remains stationary though the bird is in flight; so that the message is not likely to slip from its place” (Bullock: 229). An 1891 edition of Fanciers Journal: Devoted to Dogs, Poultry, Pigeons, and Pet Stock confirmed the use of vellum and the tail feathers when preparing and securing a carrier message. 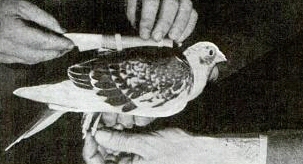 When discussing the origin and characteristics of the English carrier pigeon, the author writes of a “written message on paper, vellum or similar materials being curled and fastened round the tail feathers were thus carried by the aerial messenger to their destination” (Fanciers Journal: 187). These 19th-century sources confirmed the use of vellum as message material, and also provided a framework for understanding the use of the bone ring securing one of the vellum scrolls from Saratoga. We did not see how the ring could have been attached to a bird’s leg, but it is easy to imagine how it could have been slipped snugly onto a tail feather. The tiny vellum scrolls from the Schuyler House are too brittle for us to unroll. At this point we cannot see any evidence of writing on their surfaces. We believe, however, that the theory that these artifacts are carrier pigeon messages is a strong one. Now, we would like to hear from you! Have you ever seen artifacts like these before? 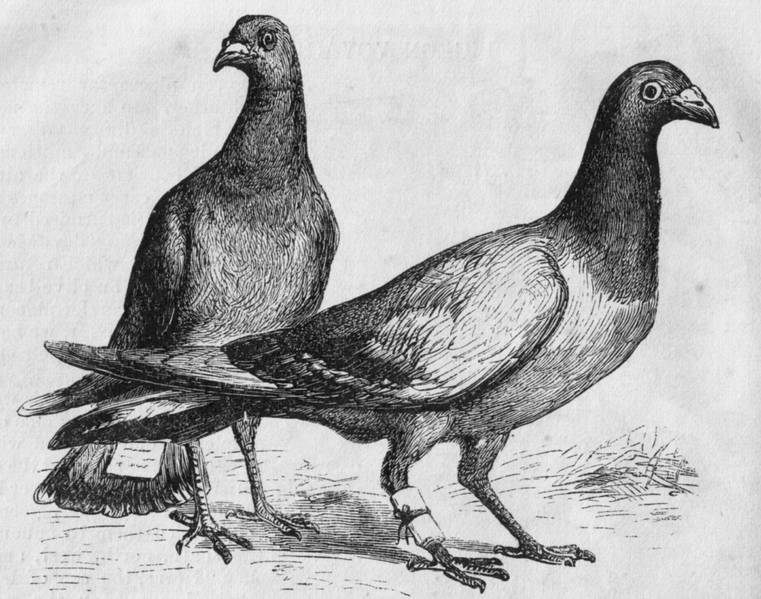 Have you ever read mention of a carrier pigeon in 18th– or 19th-century primary sources? Have you ever seen an 18th-century newspaper advertisement touting carrier pigeon supplies like bone rings? Do you have any other ideas as to what these artifacts may be? Researching this blog post was an informative task for me. I had heard of carrier pigeons, but didn’t know much about them or their history. I come away from this project with a newfound respect for what many refer to as “rats with wings.” In consideration of the many lives saved by wartime pigeons, and the countless messages relayed by these seemingly tireless birds, I say, Hats off to the pigeon! Blechman, Andrew D. Pigeons. New York: Grove Press, 2006. Bullock, Charles. Our Own Fireside. London: William Macintosh, 1866. Fancier’s Journal: Devoted to Dogs, Poultry, Pigeons, and Pet Stock. Volume 7, 1891. Gan, Geraldine. Communication. Philadelphia: Chelsea House Publishers, 1997. Jarnow, Jesse. Telegraph and Telephone Networks. New York: Rosen Publishing Group, 2004. Mountfield, Anna. Looking Back at Sending Messages. Needham, MA: Schoolhouse Press, 1998. 2 Responses to Messages from the Past: Carrier Pigeons at the Schuyler House?